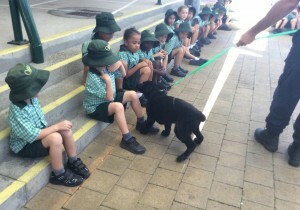 Year 1 students enjoy a visit from the Police and their Pups. There is no better way to learn all about the letter ‘P’ than a visit from Police Officers and their Puppies! During the course of the year, many visitors are brought into the school to provide rich experiences for students to write about and to cement their classroom learning. Year 1 had this pleasure earlier on this term with a visit from the Police and their dogs in training. Their main message, “Don’t be afraid of the police, they are there to help you. When you see a police officer, smile and wave at them!” The children really enjoyed this experience, as did the pups!